Exercises to increase speed and execution on the keyboard. Course produced by Stephen Freeman Community-created course This course was created by a member of the Soundslice community. In this course meant for the experienced keyboard player, Stephen shows you a few of his favorite exercises to improve dexterity, speed and strength. The exercises are tricky, dealing with single note patterns, chord cycles and efficient ways of navigating the pentatonic scale. They go by in a flash, but Stephen slows them down and offers advice on how to practice them. Stephen then takes you through a few of the most commonly used improvisational modes (Dorian, Phrygian and Lydian) and demonstrates how to put them into a playing context. If you know your basic major scales and are interested in learning how to get some new colors out of the same material, this is the course for you. 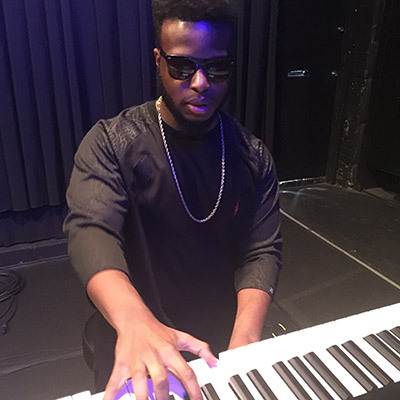 Stephen Freeman is a pianist and percussionist from South Carolina. An alum of the Atlanta Institute of Music, he was classically trained and specializes in RnB and other contemporary styles. Stephen has performed alongside Method Man, Jordin Sparks and Tyrese — and currently tours with Grammy winner Mary J. Blige.